The Great Barrier Reef is the world's largest coral reef. It is near the coast of Queensland, Australia. It is made up of nearly 2900 coral reefs and over 600 islands. It is 327,800 km² big and 2600 km long. It has been listed an important World Heritage Site by UNESCO. The Great Barrier Reef is the largest structure made by living things. It can be seen from outer space. The Reefs are threatened. The biggest threat to the Great Barrier Reef today is coral bleaching caused by high sea water temperatures as a result of global warming. During 2016, the worst die-off ever recorded occurred, due to seas warming around the Great Barrier Reef. Two-thirds of a 700-km (435 miles) stretch of coral in nine months were killed. The Reef Research Centre has found the remains of coral that are half a million years old. Corals have been growing in the region for as long as 25 million years. The corals have not always formed coral reefs. It is difficult to work out the age of the Great Barrier Reef. This is because of the way a reef can grow and shrink as the sea level changes. A coral reef can grow in diameter, that is how wide they are, from 1 to 2 cm per year. They can also grow upwards from 1 to 15 cm per year. Coral can not grow if the water is too deep (150 metres or more) because it needs light from the sun. They cannot grow out of the water (above sea level). The Great Barrier Reef Marine Park Authority and Australian Institute of Marine Science say the current, living reef started growing about 20,000 years ago. It started to grow on an older reef. This makes the beginning of the reef duringay. 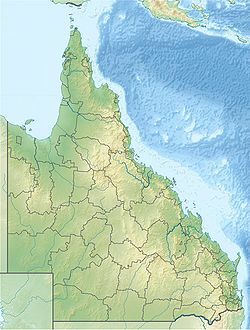 The land that forms the bottom of the Great Barrier Reef was a coastal plain. The plain had some large hills. Some of these hills were parts of older reefs. Heron Island, a coral cay in the southern Great Barrier Reef. From 20,000 years ago until 6,000 years the sea level began to rise. As it rose, the corals could grow higher on the hills of the coastal plain. 13,000 years ago the sea level was 60 metres lower than the present day. Corals began to grow around the hills of the coastal plain. These became continental islands. As the sea level rose higher, most of these continental islands were covered by water. The corals could then grow over the hills. This formed the present cays and reefs. Sea level on the Great Barrier Reef has not risen much in the last 6,000 years. The CRC Reef Research Centre has worked out that the present, living reef is 6,000 to 8,000 years old. The remains of a very old barrier reef has been found in the Kimberley area. This is in the northern part of Western Australia. The Great Barrier Reef World Heritage Area has been divided into 70 different areas. These are called bioregions. Each bioregion has its own special plants and animals. There are 30 reef bioregions, and 40 are non-reef bioregions. In the northern part of the Great Barrier Reef, there are ribbon reefs and deltaic reefs. These kinds of reef do not exist in the rest of the Great Barrier Reef system. The Great Barrier Reef has 1,500 species of fish, and many other animals, algae, and corals. This includes many vulnerable or endangered species. Some of these exist only on this reef system. Thirty species of whales, dolphins, and porpoises have been seen in the Great Barrier Reef. This includes the dwarf minke whale, Indo-Pacific humpback dolphin, and the humpback whale. Most of the population of the dugongs live there. Six species of sea turtles come to the reef to breed. These are the green sea turtle, leatherback sea turtle, hawksbill turtle, loggerhead sea turtle, flatback turtle, and the olive ridley. There are two different groups of green sea turtles on the Great Barrier Reef. One group lives in the northern part of the reef and the other in the south. Fifteen species of seagrass attract the dugongs and turtles. They also provide a food and shelter for fish. The most common kinds of seagrasses are Halophila and Halodule. Saltwater Crocodiles live in mangrove and salt marshes on the coast near the reef. No crocodile nests have been found on the reef. The salt water crocodiles on the reef travel long distances. There are not many living around the reef. Around 125 species of shark, stingray, skates or chimaera live on the reef. About 5,000 species of mollusc live on the reef. These include the giant clam, nudibranchs and cone snails. Forty-nine species of pipefish and nine species of seahorse have been found. Seven species of frogs live on the islands.Also, the Moray eel lives on the bottom, preying on fish. 215 species of birds come to the reef or nest or roost on the islands. This includes 22 species of seabirds and 32 species of shorebirds. These include the white-bellied sea eagle and roseate tern. Most nesting sites are on islands in the northern and southern regions of the Great Barrier Reef. About 1.7 million birds use the sites to breed. Seventeen types of sea snake live on the Great Barrier Reef. They take about 4 years to become old enough to breed. They usually live on the sea floor. They live in warm waters up to 50 metres (160 ft) deep. They are more common in the southern part of the reef. Four hundred species of corals, both hard corals and soft corals live on the reef. Most of these spawn, releasing thousands of eggs, in huge events. This spawning is controlled by the rising sea temperatures. This happens in spring, summer and some parts of autumn, as part of the moons lunar cycle, and the day/night diurnal cycle. Reefs in the inner Great Barrier Reef spawn during the week after the full moon in October. Outer reefs spawn in November and December. The common soft corals on the Great Barrier Reef belong to 36 different types. Five hundred species of marine algae or seaweed live on the reef. This includes thirteen types of Halimeda. These deposit chalky (calcareous) mounds up to 100 metres wide. They have mini-ecosystems on their surface which have been compared to rainforest cover. A new report, the Reef Outlook Report, says that climate change will cause huge damage to the reef. The report was written by the Great Barrier Reef Marine Park Authority. Warmer and more acidic water around the coral reef will slow down calcification, which is how the coral grows and becomes strong. The corals will become bleached (lose their colours) and many species that live on and around the reef will be in danger. The Australian government has already spent AU$325 million to improve the health of the reef in the last two years. The Reef Outlook Report also warned of other dangers to the reef. These included poor quality water running into the sea from the mainland. This water is polluted with farm insecticides and rubbish from nearby towns. The increasing amount of development on the coast is destroying natural marine and coastal habitats. There is also some damage from fishing. ↑ 1.0 1.1 1.2 1.3 CRC Reef Research Centre Ltd. "What is the Great Barrier Reef?". Retrieved 2006-05-28. ↑ Bellfield, Sarah (February 8, 2002). "Great Barrier Reef: no buried treasure". Geoscience Australia. Retrieved December 1, 2008. ↑ "CNN: Warm seas threaten Great Barrier Reef". CNN. ↑ Tom Westbrook. "Biggest-Ever Coral Die-Off Reported on Australia's Great Barrier Reef; Warm seas have "essentially cooked" hundreds of kilometers of the landmark, a surveyor says". Scientific American. Retrieved 7 December 2016. ↑ MSN Encarta (2006). "Great Barrier Reef". Retrieved 2006-12-11. ↑ 8.0 8.1 Tobin, Barry (2003). "How the Great Barrier Reef was formed". Australian Institute of Marine Science. Retrieved 2006-11-22. ↑ Western Australia's Department of Environment and Conservation (2007). "The Devonian 'Great Barrier Reef'". Retrieved 2007-03-12. ↑ Great Barrier Reef Marine Park Authority. "Representative Areas in the Marine Park". Retrieved 2007-03-23. ↑ Great Barrier Reef Marine Park Authority. "Reef Bioregions of the Great Barrier Reef World Heritage Area". Retrieved 2007-03-23. ↑ Great Barrier Reef Marine Park Authority. "Non-Reef Bioregions of the Great Barrier Reef". Retrieved 2007-03-23. ↑ 13.0 13.1 Great Barrier Reef Marine Park Authority (2000). "Fauna and Flora of the Great Barrier Reef World Heritage Area". Retrieved 2006-11-24. ↑ 14.0 14.1 14.2 14.3 14.4 14.5 14.6 CRC Reef Research Centre Ltd. "REEF FACTS: Plants and Animals on the Great Barrier Reef". Retrieved 2006-07-14. ↑ Great Barrier Reef Marine Park Authority (2004). "Environmental Status: Marine Mammals". The State of the Great Barrier Reef Report - latest updates. Retrieved 2007-03-13. ↑ Dobbs, Kirstin (2007). Marine turtle and dugong habitats in the Great Barrier Reef Marine Park used to implement biophysical operational principles for the Representative Areas Program (PDF). Great Barrier Marine Park Authority. ↑ Great Barrier Reef Marine Park Authority (2005). "Environmental Status: Seagrasses". The State of the Great Barrier Reef Report - latest updates. Retrieved 2007-05-23. ↑ Great Barrier Reef Marine Park Authority (2005). "Environmental Status: Marine Reptiles". ↑ 20.0 20.1 20.2 "Appendix 2 - Listed Marine Species". Fauna and Flora of the Great Barrier Reef World Heritage Area. 2000. Retrieved 2007-05-23. ↑ "Environmental Status: Sharks and rays". The State of the Great Barrier Reef Report - latest updates. Retrieved 2007-05-23. ↑ 22.0 22.1 "Appendix 4- Other species of conservation concern". Fauna and Flora of the Great Barrier Reef World Heritage Area. 2000. Retrieved 2007-09-13. ↑ "Appendix 5- Island Flora and Fauna". Fauna and Flora of the Great Barrier Reef World Heritage Area. 2000. Retrieved 2007-09-13. ↑ Great Barrier Reef Marine Park Authority. "Environmental status: birds". The State of the Great Barrier Reef Report - latest updates. Retrieved 2007-05-23. ↑ "Environmental status: birds Condition". The State of the Great Barrier Reef Report - latest updates. Retrieved 2007-05-23. ↑ Great Barrier Reef Marine Park Authority (2006). "Information Fact Sheets #20 Coral Spawning" (PDF). Retrieved 2007-05-27. ↑ Australian Institute of Marine Science (2002). "Soft coral atlas of the Great Barrier Reef". Retrieved 2007-05-27. ↑ 31.0 31.1 "Great Barrier Reef Outlook Report". Great Barrier Reef Marine Park Authority. 2009. Retrieved 2009-10-13. Bowen, James; Bowen, Margarita (2002). [Great Barrier Reef at Google Books The Great Barrier Reef : history, science, heritage] Check |url= value (help). Cambridge : Cambridge University Press. ISBN 0-521-82430-3. 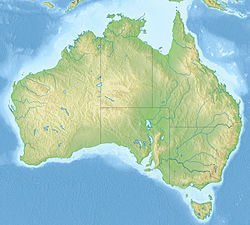 Wikimedia Commons has media related to Great Barrier Reef. This page was last changed on 20 November 2018, at 07:47.